Junk downgrade: A self-fulfilling prophecy? Johannesburg - Moody's affirmed South Africa's investment-grade credit rating but kept its negative outlook. Moody's announcement late on Friday - after domestic financial markets had closed - marked the conclusion of the ratings review for a possible downgrade of South Africa's Baa2 rating it launched in March. The ratings agency said that its ratings decision was based on its assessment that South Africa "is likely approaching a turning point ... and that recent political developments, while disruptive, testify to the underlying strength of South Africa's institutions". It said a downgrade could be triggered if economic growth, which it forecasts at 0.5 percent this year, fails to revive or if the government "unduly" delayed reforms. Moody's also noted two recent court judgments against President Jacob Zuma, one over misuse of public funds for his private residence, and a second that could see him face almost 800 graft-related charges. These "attest to the strength and independence of South Africa's constitution and judicial system," it said. 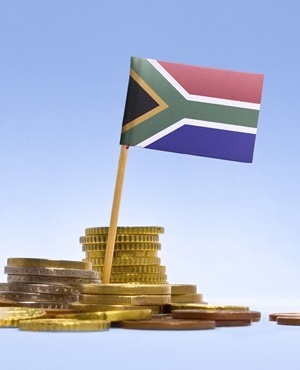 Nomura emerging markets analyst Peter Attard Montalto said in a brief note the move was a "marginal positive" but noted that Moody's has been more upbeat on South Africa than other credit ratings agencies. Standard & Poor's, which is expected to review South Africa in June, both rate the country BBB-, a notch lower than Moody's and the lowest investment-grade rating. A Reuters poll in April predicted that at least one of South Africa's ratings would be cut to "junk" this year, reflecting sluggish economic growth and political ructions since Zuma shook markets in December by firing Finance Minister Nhlanhla Nene. Zuma replaced Nene with an unknown backbencher but the impact on the rand and other assets forced him within days to recall the respected Pravin Gordhan to the post. Deputy Finance Minister Mcebisi Jonas later sparked a political scandal by saying the wealthy Gupta family, which has close ties to Zuma and his family, had offered him Nene's role. Zuma's legal woes have raised the stakes for local elections on August 3 which analysts say will be the sternest political test his ruling African National Congress (ANC) has faced since coming to power in 1994. "The local government elections ... will be a litmus test as to whether and by how much these developments are eroding the ANC's electoral support and the consequences for the robustness and clarity of economic and fiscal policy," Moody's said.